A nightlight is a necessity, but most people just go to their local drug store to buy cheapo plug-in nightlights. 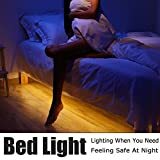 This is a bad idea for a few different reasons, but the biggest one is the fact that these nightlights stay on anytime your room is dark, so they disrupt your sleep. If you want something much better, check out the Vansky Motion Activated Bed Light. It’s a flexible LED light strip with a motion detector attached, and you stick it under your bed. That way it turns on automatically anytime you step out of bed in the middle of the night, and then it turns back off when you go back to sleep.